No, your eyes don’t deceive you: the image you’re looking at is a Koenigsegg Regera with a custom purple paint job which isn’t part of the official color options. 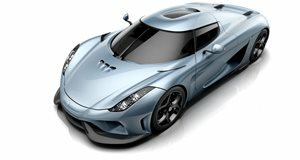 What makes it special, however, is that this isn’t a fan edit – it’s a render made by Koenigsegg itself. It’s part of a new series in which the Swedish supercar maker invites its employees to dream up their ideal Regera configuration. This first eye-catching design was produced by Koenigsegg’s Communications and Copywriter Steven Wade, in honor of the late Prince. “Vox will laugh at me (as might a million others),” Wade jokes, “but I’ve chosen a purple carbon exterior finish, with white striping and clear carbon side intakes. I’m a massive Prince fan (still grieving) and I’ve always loved our cars in purple.” It’s hard to argue – it probably shouldn't work, but it looks surprisingly stunning. He admits he wanted to pepper the body with gold leaf stripes “like the purple/gold combination of chassis 7094,” but decided that gold works better with paint than tinted carbon. Complimenting the exterior design are carbon wheels combined with white calibers. As for the cabin, Wade’s ideal Regera features a snow white leather interior with basket weave pattern on the seats and blue stitching. “Yes, anyone who got into the car would have to be impeccably clean,” Wade explains. Don’t worry, he hasn’t gone too mad: if this was a real car, the stitching would be purple to match the exterior. These are all purely cosmetic changes of course, so we presume that Wade would leave the monstrous 1500 horsepower setup as is. Not that the Regera needs any more power, mind you. We reckon Prince would be proud. What do you make of Koenigsegg's take on The Little Red Corvette?